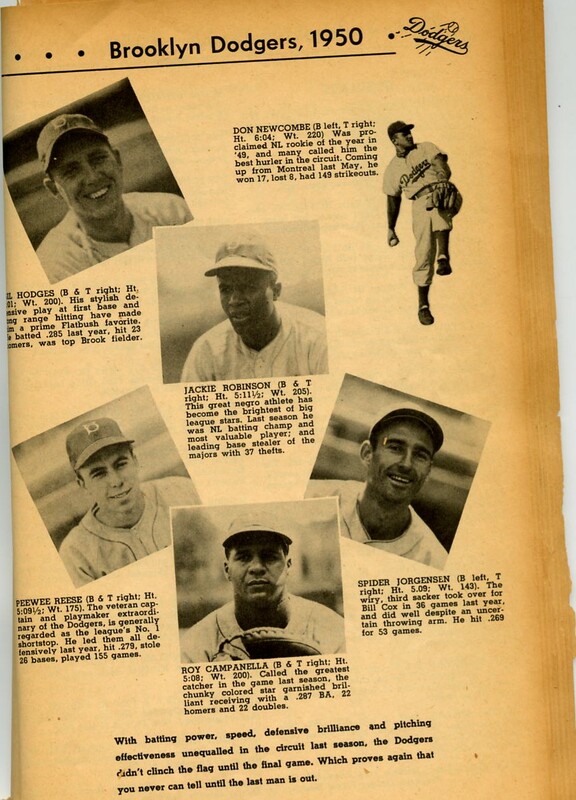 The Brooklyn Dodgers 1950 set a new NL record with 183 double plays First Baseman Gil Hodges, Second Baseman Jackie Robinson and third baseman Billy Cox all led the National League in fielding percentage in 1950. Billy Cox, Brooklyn Dodgers Third Baseman, RH - although injuries curtailed his playing time several times in 1950, he still led all National League third basemen defensively with a .957 percentage - 102 putouts, 233 assists, 35 double plays, 15 errors in 107 games. Cox batted .257, 17Ds, 2Ts, 8Hrs, 62 Runs, 44 RBIs , 6 Stolen Bases. Spider Jorgensen, Brooklyn Dodgers 3B, Bats Left, T RH - played just two games with Dodgers in 1950 and then was traded to New York Giants. PLayed in majors from 1947-1951. John Jorgensen was born in Folsom, CA. Pee Wee Reese, Brooklyn Dodgers Shortstop, RH - a Hall of Famer, the Bums' sparkplug was always able to rally the team to a higher level during clutch situations. Reese posted 282 putouts, grabbed 398 assists, 94 DP, 26 errors for a .963 pct... In 141 games, the little captain hit .260, 21Ds, 5Ts, 11Hrs, scored 97 runs, 52 RBIs and led the Dodgers again with 17 stolen bases. Jackie Robinson, Brooklyn Dodgers Second Baseman, RH - A Hall of Fame member, he aggressively covered the keystone position, and led all NL second basemen with a sterling .986 pct, 359 putouts, 390 assists, 133 double plays, 11 errors in 144 games. Robinson batted .328, second highest in the league, his 39 doubles led the team... 4Ts, 14 Hrs, 99 Runs, 81 RBIs, 12 SB. Gil Hodges, Brooklyn Dodgers First Baseman, RH - one of the top fielding first baseman in baseball history... in 1950 he led the NL with a resounding .994 pct., and led the team in home runs with 32 and in RBIs with 113... and, set a new major league record by whacking 4 homers and a single in one game - 17 total bases. In 1950, Hodges collected 1,273 putouts, an even 100 assists, 159 DP, 8 errors... '50 stats: .283 BA, 26Ds, 2Ts, 32Hrs, 98 Runs, 113 RBIs, 6 SB in 153 games... Note: baseballhistorian.com ranks Hodges as a future Hall of Famer. Roy Campanella, Brooklyn Dodgers Catcher, RH - a Hall of Fame Member - one of the top five catchers defensively and offensively of all-time... one of the strongest men in this era, the 5-ft, 8-inch, 200-pounder maintained his All-Star rating in 1950. Campy's punch at bat delivered 19 Ds, 3Ts and 31 home runs, 70 Runs, 89 RBIs, batted .281... posted .985 fielding pct., 683 putouts, 54 assists, 14 DP, 11 errors in 123 games. Bobby Morgan, Brooklyn Dodgers 3rd Base & Shortstop, RH - a star shortstop in the minors... playing in his rookie year he was used at 3rd base in 52 games by Bums' manager Chuck Dressen to replace the injured Billy Cox. In 1950 Morgan fielded a solid .969 at third and hit .226, 10Ds, 3Ts, 7 Hrs in 67 games... Bob Morgan Played 8 years in the majors - the first three for Brooklyn. Bruce Edwards, Brooklyn Dodgers Catcher, RH - the veteran backstop was used mainly as a backup to Campanella in '50 - posting a .980 fielding pct in 38 games. Edwards played 10 seasons in the majors - Brooklyn 1946-51; Chicago (NL) 1951-54; Washington 1955; Cincinnati 1956. Eddie Miksis, Brookltn Dodgers Infielder, RH - well-regarded defensively... debuted into the majors with Brooklyn back in '44... he played in 51 games at SS/2B/3B and batted .250 with 5 extra base hits... Miksis played 14 seasons in the majors, the first 6 1/2 with Brooklyn, was traded to Chicago (NL) in mid-1951 and played regularly at second base until traded to St Louis NL) prior to the '57 season.